Online self-service for company administration, powered by Estonian e-Residency. If you have already signed up with LeapIN, but don't have your e-Residency ID-card yet, then log in with your email. How does email log in work? Please check that the smart card reader is connected to your computer and your e-Residency ID-card is in the reader. You will need your PIN1 code in order to log in. How to install the software on Win OS? How to install the software on Mac OS X? Smart-ID is a fast and secure option for e-Residents to authenticate yourself. It is free of charge and works across multiple devices. What is Smart-ID and how does it work? How to get a Smart-ID app and account? 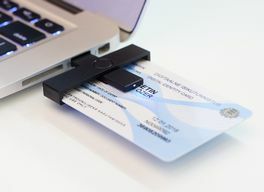 Estonian e-Residency offers you a government-issued smart ID-card which provides digital identification and authentication to secure services and digital signing of documents and transactions. To start, sign up with LeapIN and we'll gently guide you through the whole process of becoming an e-Resident, starting your company, getting banked and then running your business. LeapIN was designed keeping users in mind, so all the complexity is made simple, and annoying administrative tasks are solved in the background.